.....Total Score: 9.0 + TT Innovation Award! Introduction: Boats come in all sizes, shapes, and sizes...but among all the portable watercrafts available today, nothing quite compares to the Porta-Bote. 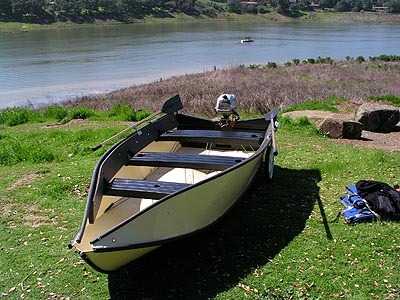 This unique, one of the kind, boat folds up to a surfboard size and becomes a fully functional row or powerboat on the water when fully expanded. While some people are skeptical about how well a fold up craft can perform, we found the Porta-Bote delivered respectable hydrodynamics, solid stability, and most of all...was extremely portable and effortless to employ. Introducing the Porta-Bote Genesis 10ft. model. About Porta-Bote: After a very successful career in the publishing field, Porta-Bote's CEO Sandy Kaye bought the rights of the folding boat design in 1973 and has driven the business by redesigning the boat to be more efficient, introducing new accessories, and much more. The Porta-Bote design was actually created in 1969 by Sandy's friend. The original concept was a good one, but unfortunately the first design didn't interest many outdoor enthusiasts. It was double ended, like a canoe. A lot of re-engineering by the man himself, and the Porta-Bote had the right design and features to garner worldwide sales. Impressions: The first time I saw a Porta-Bote in person was during a trip to the Eastern Sierras. Trout fishing and testing gear in a remote lake where the dock held a series of aluminium rental boats and at the end of the line up was a Porta-Bote. I didn't get to see one folded up until I visited Porta-Bote and met the mastermind himself. Sandy showed me the boat as it was opened up, and right there he taught me how to disassemble it in a few quick minutes. Needless to say, I was quite eager to learn more about the design and whether this boat could fit the needs of anglers. The Design: In 1969 the Porta-Bote was born. The portability concept was always there, but the overall hull design and shape was somewhat different. The "original" watercraft was a double ended boat, where there was no bow and stern, just two bows. In this design, the folding boat didn't have good stability as there was less surface area that supported the boat. Soon after Sandy took over the business, a redesign was put in place immediately. Sandy re-engineered the Porta-Bote as we see today, having a bow and a stern. The new innovative boat now has a wide beam for much stability, and it has the ability to mount an electric or gas powered motor, bringing the Porta-Bote to a whole new level in terms of application and of course the ability to fish from it. Accessories: The Porta-Botes are designed to fit the needs of many types of outdoorsmen by providing accessories per application. 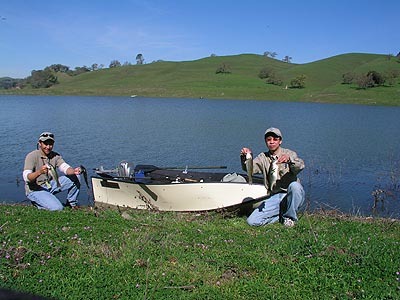 For anglers there are a few items that are worth mentioning such as the bow trolling motor mount, oars, sun top, and the dolly for easy transportation. 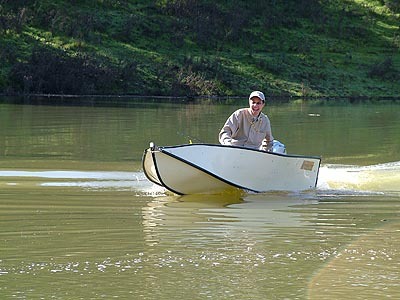 Real World Tests: With its unique construction and ability to fold and unfold in minutes, we knew this would be an fantastic watercraft to take on local lakes and on trips to remote watering holes. 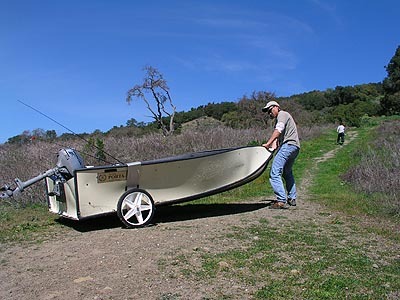 The 10' Porta-Bote Genesis was taken to Anderson Reservoir where we hand launched it early in the morning before any fishermen were able to get onto the water via the standard launch facilities. The boat held Zander and I, a 27 pound Honda outboard, 1 gallon of spare fuel, Porta-Dolly, accessories, and a load of fishing tackle. Powering across the lake is effortless as the boat planes quickly with a tiny 2 hp OUTBOARD! Maneuverability: Although the 10' Porta-Bote is capable of holding a 5HP outboard, we used a 27lb outboard that produced 2HP which was plenty of power for use in medium sized lakes. When we fished from the Porta-Bote, moving around using both a gas motor and the oars was simple. The boat has a deep V entry hull at the bow that cuts through the water with ease. While we ran from point to point fishing, we made good timing and used minimal gas as the Porta-Bote planes fairly quickly, even with a 2HP motor. When we reached our destination we used the oars to go into stealth mode as we moved closer in to target sweet spots. 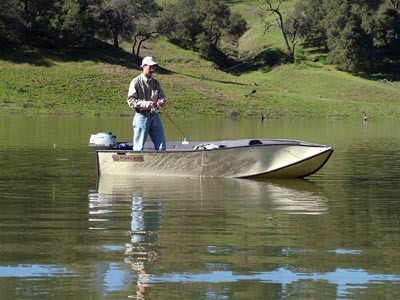 When hitting shallow areas, the Porta-Bote only needs 4 inches of water to float, but we recommend the use of oars at this time rather than your outboard or trolling motor to prevent any damage it may cause to your motor shaft and propeller. Having this ability of moving about in shallow areas will get you to fishing spots others might not be able to reach in larger boats. Because the hull is somewhat flexible, it does take some energy to put the Porta-Bote in motion while motoring or rowing. When using the outboard or oars, our results showed that the flex is so minimal that it's not a real concern. Stability: The stability of the 10' Porta-Bote Genesis IV is actually quite impressive on the water. Even with the Flexi-hull, both Zander and I were able to stand up and fish at the same time. Because only the bow section of the 10' model has a deep V, the rest of the boat is fairly flat with a beam of 5 feet across. The wide beam gives the watercraft much more surface area to float on and provides the stability that I welcome especially when standing up and tossing lures. Because the hull is constructed out of a copolymer Polypropylene, it takes impact from waves and wakes from other boaters very well. The Flexi-hull absorbs the impact softy, minimizing any roll or instability you might feel such as in an aluminium boat. The design results in an easier and comfortable ride, no pounding waves like a stiff hull, and the feel of stability as you move about the water. Safety: How safe is the Porta-Bote? Virtually unsinkable, explains Sandy Kaye, CEO of Porta-Bote. The Porta-Bote has been designed to stay afloat and leveled even when filled with water. Polypropylene alone is already buoyant, and with the addition of the inner-side foam material and hollow seats plus transom allows even greater floatation. For anglers who don't like to fish on inflatables fearing they will get a hook in it, well, the Porta-Bote will not have this problem. In addition to the boat being unsinkable, its stability is good and while we fished standing up, we felt completely safe in both calm and open waters. Durability: Before I explain how durable our Porta-Bote test unit is, I would like to share with you what applications the hull material Polypropylene is used for in today's products. Many of you see and touch this type of material daily. This thermoplastic is used to make car bumpers, fibers for carpeting, housewares, refrigerator parts, bottle caps, bottles, medical products, fishing tackle boxes, and much more. Because a buffered Copolymer Polypropylene is highly resistant to extreme temperatures and chemical harm, has excellent moisture barrier properties, and good fatigue resistance, it is the perfect material in which to compose the Porta-Bote. Now that we know more about the hull material, let's see how it did during our on the water tests. The Porta-Bote's hull, 1/4" thick, and took on zero damage as we stepped on it from both interior and exterior, landed it on various rough surfaces, and during transport on top of an SUV. With a hull like this, you won't have to worry about dropping lures inside the boat nor having any problems when the lure runs up the side of the Porta-Bote. The Porta-Bote is completely covered with a ultraviolet inhibitor to prevent any damage from the sun's harmful rays. To further add protection to the Porta-Bote Genesis, each edge is fitted with a rub rail that will take the brunt of the damage especially when landing. Portability: This watercraft wasn't named Porta-Bote for nothing. 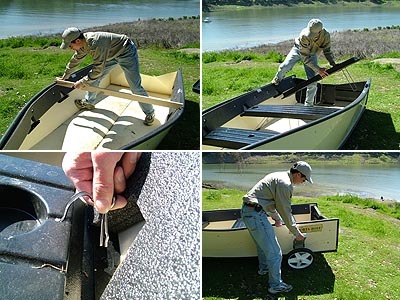 The boat is extremely portable and very easy to store. 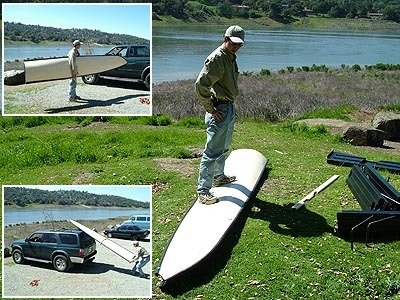 The Porta-Bote Genesis can be folded down to a surfboard size of only 4 inches (11cm) thick! When folded the Porta-Bote 10' model can fit on top of sedans, trucks, SUV's, jeeps, RV's, planes, and other boats. We transported the test unit on the roof racks of a 4Runner, tied on with ropes, and we were off in minutes to our fishing location. The boat and the foam filled seats are also light enough for one person to haul around, either loading, storing, or bringing it down to the launch area. Speaking of launching, one can purchase the Porta-Dolly that hooks onto the side of the boat, and in seconds you are wheeling your way to and from the water with all your fishing tackle and motor in one trip. Comfort: The Porta-Bote is pretty much a shell made of Polypropylene. Since the hull gives some flex, standing up on it will not cause much fatigue because it's almost like standing on a spring as the floor of the boat will absorb any shock, making it especially easy on the knees. The only addition we would like to see are padded seats. Right now the seats are molded out of hard plastic and sitting down on them all day can be tiring. Some people actually modify their rig by adding a captain style chairs with a backrest which provides much better ergonomics while seated. Warranty: Not many boats, especially portable ones, come with such a advantageous warranty like the one Porta-Bote offers. 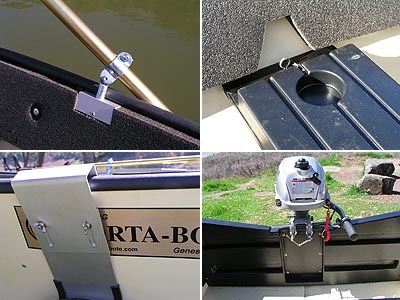 Because this boat is extremely durable and the Polypropylene is virtually bulletproof, Porta-Bote provides a 10 year limited warranty on the hull and hinges. Conclusion: For anglers that love travelling to secluded fishing holes far out in the countryside, have limited transportation, or minimal storage space but still want a solid hull craft, the Porta-Bote is the one stop answer for all your needs. This boat is quick and easy to set up either alone or with a buddy, getting you on the water in a fleeting amount of time. The Genesis 10ft model we tested demonstrated extremely good hydrodynamics as our 2HP Honda outboard put it in motion with little effort. While standing up to fish, both Zander and I felt extremely safe due to the stability of the watercraft, this boat is virtually unsinkable and the material used to build the hull and its secret hinged design is ingenious. After decades of producing these boats Porta-Bote has confidence in its product tacking on a 10 year limited warranty, which is unheard of in the industry. The Porta-Bote is the ideal watercraft for anglers on the go, and the fact that anglers can transport this boat with ease, and still have to make no sacrifices when it comes to features and performance, make the Porta-Bote an easy choice for our Innovation Award!